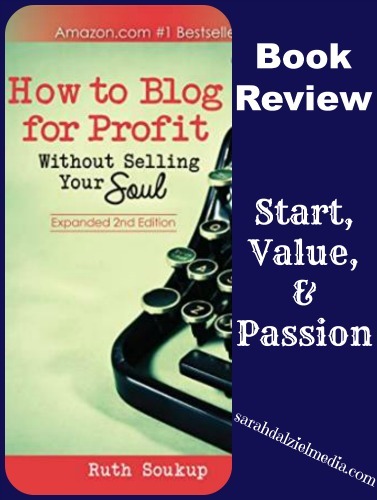 Last week I spent a few days reading and studying “How to Blog for Profit: Without Selling your Soul” 2nd edition by Ruth Soukup. While her tips and suggestions are very helpful, what I found most helpful was the emphasis on providing quality content as the first and foremost need when building a blog. Whether or not you currently have any hope of making a cent on said blog. Partially thanks to studying How to Blog for Profit, I have changed some of my blogging practices to try and provide more quality content, including implementing a blogging schedule. So we’ll see how that works over the next few months. One thing I enjoyed about this book is that it does not emphasis the “profit” side, but rather the “how to blog” side. The powerful emphasis on being authentic and passionate about your blogging topics struck a chord with me. Is what I’m talking about what I am also passionate about? Or is it just what I think I can write about, or that people want to hear? Of course, I know that audience building takes more consistency than I’ve had for the last year, but that is changing now. Of course, the challenge in the honesty of Ruth Soukup’s book is that there is no magic formula, hack, or pill to make a blog an overnight success, or even guarantee any income from a blog no matter how much work and effort you put in. The only thing guaranteed from running a blog is a lot of hard work, consistency, writing, and challenges. If all that is guaranteed from a blog is hard work, writing, and challenge, what is the point of even starting? Well, no one said that everything in life would be easy. So, I guess if it’s hard to do, not everyone is successful at it, and it takes persistence too, then it may just be very well worth doing. Most hard things are worth doing when you think about it. A University degree is hard, but can be worth the doing. Traveling, doing ministry, writing and publishing a book, doing NaNoWriMo, are all hard and all well worth doing. Of course, doing something just because it is hard can be pointless. As someone with a small blog, looking at the numbers and statistics in Ruth’s book can be very discouraging. Is it even possible to build a blog that much? Numbers, I find, can be discouraging or encouraging. Since I have two sites, I have the added challenge of trying to apply the principles in this book to two sites at once. While the process, as detailed by How to Blog for Profit, is overwhelming when looked at as a whole. I will also admit that the only way to see if anything will work is to implement, try, and then be consistent. I highly recommend this book if you are interested in blogging, or growing an already existing blog to make sustainable income. If there is something overwhelming in your life, a goal that you’ve had but never accomplished, take some time and evaluate it. Break it into steps, and maybe that first step isn’t that impressive or huge. However, if you never start you are 100% guaranteed to not succeed. Every single person who has ever succeeded in their endeavor to do something difficult succeeded because they STARTED. I love hearing from you, leave a comment with your thoughts on starting, or on blogging, or on life in general. If you’d like something to think on, answer the question “what have you avoided starting because it just seemed too overwhelming?” and comment on that.